I worked out at 9:30. I made sure to warm up before attempting today’s Hero WOD. Wow. Just, wow. This was very, very challenging, both physically and psychologically. I measured a 75m route from the garage door to the CFS sign at the entrance to 64 West Business Park. My strategy was to not attempt pull-ups, front squats, or pushups until I was prepared to attempt and hopefully complete 7 unbroken reps. I knew full well, however, that it was unlikely that I’d be able to complete 10 rounds of unbroken HSPUs. Uhm, I can’t recall a time when I’ve done more than 45 HSPUs during a WOD. I also wasn’t sure if I’d be able to complete front squats unbroken, as 135# is a mere 7# less than my bodyweight and 65% if 1RM. Running was a welcome relief from pull-ups, squats, and pushups. That’s just about all that I have to say about running. I completed all rounds of CTB pull-ups unbroken. I was so concerned that my chest wouldn’t touch the bar and that I’d fail a rep that I often very forcefully pulled my chest to the bar. I have marks on my chest as proof. I also completed front squats unbroken in that I didn’t rest for even a brief moment between any of the reps. Granted, the last reps of any set were slower than the earlier reps, as the weight began to feel very heavy. Handstand pushups went better than expected. I kipped all reps. I completed rounds 1 through 4 unbroken, round 5 in reps of 6 & 1, and round 6 in reps of 1, 5, & 1. 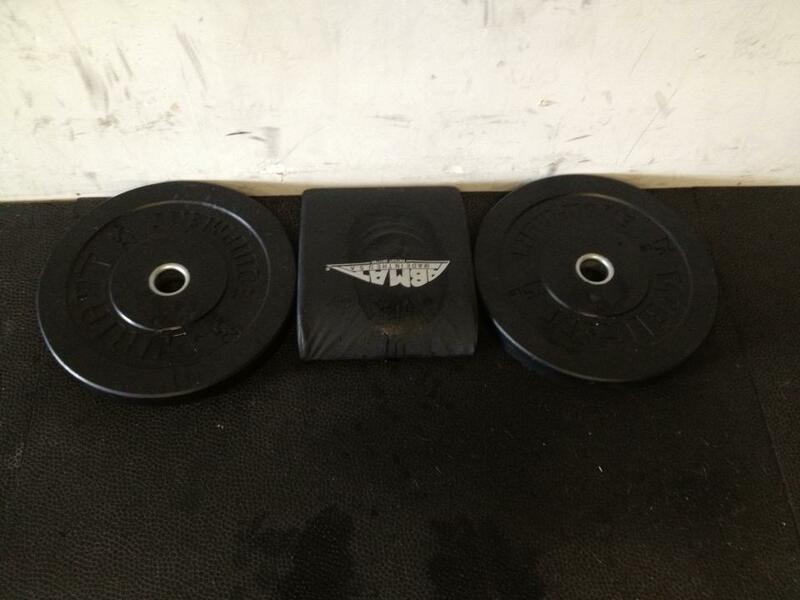 Uhm, I had sweated so much on the plates, Abmat, and floor that my hands slipped after I locked out the first rep. Ha! I completed rounds 7 and 8 in reps of 5 & 2, and round 9 in reps of 4 & 3. I was exhausted by the last round. I completed 3 reps, rested a moment, completed 2 more reps — and then got greedy. I failed the 6th rep. I was, however, able to complete the last 2 reps unbroken. As I had completed the first round in 3 minutes, I set a goal to complete the entire workout in less than 35 minutes, allowing extra time for HSPUs. I completed the workout in 32:32, and was completely spent after doing so. My arms ached and trembled. I can’t begin to explain how many disparate thoughts went through my mind during this WOD. For example, I was very tempted to stop working after 5 rounds and had to talk myself out of doing so. I knew that this was going to be difficult — as a Hero WOD should be. I wasn’t mistaken, and this may very well be one of the most difficult WODs I’ve completed to date. Even more difficult than “Murph”. Uhm, much more difficult than “Murph”. I found myself saying “Sh!t” each time I finished a 150m run and walked into the box. I had to constantly wipe the sweat from my eyes. I had to constantly not only chalk my hands but change where I placed my hands on the pull-up rig. The pull-up bar itself was dripping with sweat. I also found myself saying “Sh!t” after the 7th front squats, as my wrists ached. I did laugh out loud once when I found myself saying — out loud, of course — “What would Melinda do?” Melinda, like me, talks to herself during workouts, although I’ve never heard her say “Sh!t”. I found myself saying things such as “Don’t touch the bar until you’re ready”, “Unbroken”, and “Don’t stop, don’t stop”. I’m still considering what Hero WOD to program for the upcoming July 4th celebration. Posted in Misc	"Hero" WOD"Hero" WOD "Bulger"